This is sarcasm, you understand. As far as I’m concerned, there’s nothing wrong with Transformers at all. Hell, when I found out Chevy was offering a Transformers package I nearly wet myself. 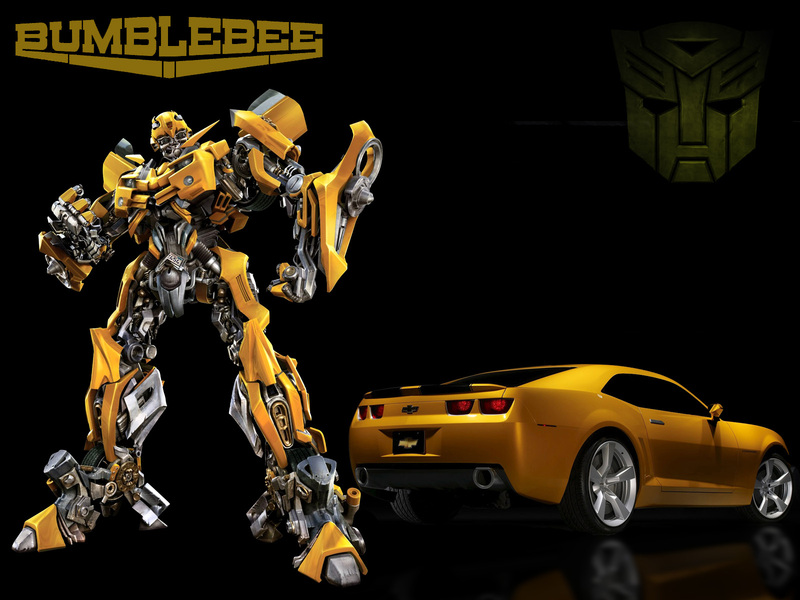 I mean, I would be the absolute coolest mom in the world if I could park Bumblebee in my driveway. (And yeah, I know it’s not quite the *right* shade of yellow, but that didn’t stop me from building one online. $40 k later…eh, I’m a tad less likely, but you never know.). Anyway, the point of this mini-rant is that Connor is mildly obsessed with them. Just like he was mildly obsessed with Thomas the Tank Engine a few years ago, and Speed Racer after that. And next year, I’m sure it will be something else – Astroboy, maybe. Bakugon. Whatever it is, I’m sure it will be Japanese and plastic. Anyway, obsession being what it is, when he’s in school he’s required to write in a daily journal. Usually 3 or 4 sentences on whatever topic he chooses. (Except Friday – the teacher picks the topic that day). Well, I got to take a look at the journal during a recent conference and what do you think he writes about every day? If you said sunshine and lollypops, then you haven’t been paying attention. Page after page of it – complete with lovely illustrations. All about Bumblebee, Optimus Prime, StarScream, Megatron…whatever. Why they’re cool. How well they fight. Explosions. Death. Dismemberment. Guns. How frigging awesome giant robots that change into cars are. You know, the stuff that mildly obsessed 6-year-old boys will write about. His teacher gave mr myn and I one of those wan sorts of smiles, telling us that we really should encourage him to write about something else. Because, you know, this sort of thing won’t be tolerated in later grades. (The repetitiveness of the subject matter being at issue, not the content). Mr Myn and I just looked at each other and laughed. And then he took out his cell phone and snapped a shot of one of Connor’s Optimus Prime drawings. But does that mean Transformers are the end all/be all of cultural scions? Well, no. Of course not. But I still want one in my driveway. 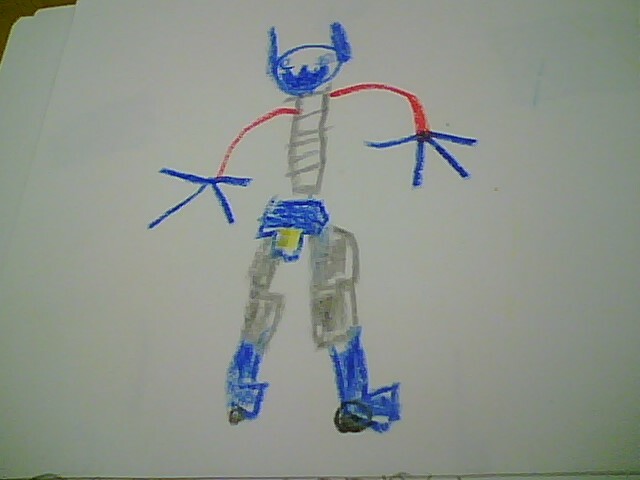 This entry was posted in random, rant, transformers. Bookmark the permalink. Dude, you and the hubby are MUCH better than me. With the mood I've been in the last two weeks, I probably would have very well told that teacher to just STHU. This is a 6 year old, for goodness sakes!! What 6 year old do you know that's NOT mildly obessive about something. Give me a break. At least Connor has the ability to put together a properly structured, coherent sentence at his age. You have some people graduating from high school that read on a 3rd grade level. My 10 year old he started out with Blues Clues, and now he's currently enthralled with all things military, history, and war related. It comes and goes. And as long as he does express interests in other things, and learning at or above his grade level, who I am to tell him not to like what he likes. Heh. You know it. Personally, I think *this* guy has the right idea…just watch until the end.